On September 6, 2018, State Councilor and Foreign Minister Wang Yi held talks with visiting Minister for Foreign Affairs Gudlaugur Thór Thórdarson of Iceland. Wang Yi expressed that Iceland is the first country in Western Europe to recognize China's market economy status, the first European country to sign a local currency swap agreement and the first European country to sign a bilateral free trade agreement with China as well. Such gestures are not only of great significance to both China and Iceland, but also play a leading role in China-Europe exchanges. In recent years, China-Iceland relations have maintained sound development, and both sides should continue to accommodate each other's core interests and major concerns and increase mutual understanding and political mutual trust on this basis. Iceland is of great importance in geography and serves as a natural partner for Asia and Europe to carry out connectivity cooperation. Both sides should enhance the alignment of development strategies and carry out cooperation centering on the construction of the Belt and Road Initiative. The two sides should also actively expand practical cooperation in such fields as economy, trade, geothermal energy, tourism, Arctic affairs and climate change, so as to further benefit the two peoples. Wang Yi noted that given that unilateralism and protectionism are on the rise currently and the international situation faces increasing uncertain and unstable factors, the Chinese side is willing to, together with the Icelandic side, strengthen coordination in international affairs, jointly abide by multilateralism, safeguard the international system with the United Nations as the core, jointly build an open world economy, and maintain the free trade system with the World Trade Organization as the core, in a bid to contribute to promoting regional and world peace and development. Gudlaugur Thór Thórdarson expressed that since Iceland and China established diplomatic relations, bilateral relations have always maintained sound development, playing an exemplary role in European countries' relations with China. In recent years, both countries have achieved remarkable outcomes in economy, trade, geothermal energy, energy, tourism, Arctic affairs and climate change and other fields. The Icelandic side agrees with the Chinese side's proposal on the development of bilateral relations in the next stage, and will continue to adhere to the one-China policy, increase political mutual trust with the Chinese side, intensify people-to-people and cultural exchanges, beef up economic and trade exchanges, and expand practical cooperation to elevate Iceland-China relations to new stages. Iceland holds an open attitude towards the Belt and Road Initiative and stands ready to make joint contributions to facilitating connectivity in Eurasia with the Chinese side. The Icelandic side is willing to take the opportunity of assuming the rotating presidency of the Arctic Council to deepen cooperation in Arctic affairs between both countries. 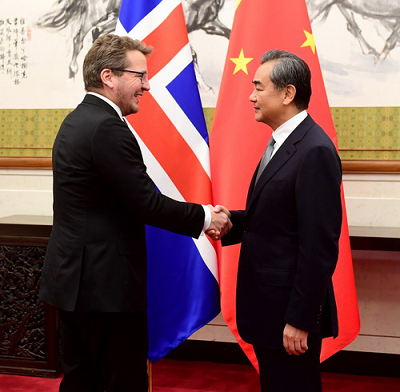 Supporting free trade, Iceland adheres to international rules, and stands ready to enhance communication and coordination in international affairs with the Chinese side to jointly promote multilateralism and cope with global challenges. Both sides also exchanged views on international and regional topics of mutual interest.